Pope Francis’ address at a university in Ecuador is worthy reading for everyone involved in higher education. He gives a prophetic call to all who shepherd young people towards and through a college education asking us to make our institutions truly places of social change. Going against the received wisdom of marketing and recruitment he asks, “How do we help our young people not to see a university degree as synonymous with higher status, money and social prestige. How can we help make their education a mark of greater responsibility in the face of today’s problems, the needs of the poor, concern for the environment?” Some of this we at SMC are good at and some of it not. The whole of the remarks are printed below. Meeting with Educators at the Pontifical Catholic University of Ecuador, Quito, Ecuador. I am very happy to be here with you this afternoon at the Pontifical Catholic University of Ecuador, which for almost sixty years has helped to further the Church’s educational mission in service to the men and women of this country. I am grateful for your kind words of welcome, which expressed your profound hopes and concerns in the face of the challenges, both personal and social, of your work as educators. In the Gospel we have just heard, Jesus, the Master, teaches the crowds and the small group of his disciples by accommodating himself to their ability to understand. He does this with parables, like that of the sower (cf. Lk 8:4-15). He does it in a way that everyone can understand. Jesus does not seek to “play the professor”. Instead, he seeks to reach people’s hearts, their understanding and their lives, so that they may bear fruit. The parable of the sower speaks to us of “cultivating”. It speaks of various kinds of soil, ways of sowing and bearing fruit, and how they are all related. Ever since the time of Genesis, God has quietly urged us to “cultivate and care for the earth”. God does not only give us life: he gives us the earth, he gives us all of creation. He does not only give man a partner and endless possibilities: he also gives human beings a task, he gives them a mission. He invites them to be a part of his creative work and he says: “Cultivate it! I am giving you seeds, soil, water and sun. I am giving you your hands and those of your brothers and sisters. There it is, it is yours. It is a gift, a present, an offering. It is not something that can be bought or acquired. It precedes us and it will be there long after us. Our world is a gift given to us by God so that, with him, we can make it our own. God did not will creation for himself, so he could see himself reflected in it. On the contrary: creation is a gift to be shared. It is the space that God gives us to build up with one another, to build a “we”. The world, history, all of time – this is the setting in which we build this “we” with God, with others, with the earth. This invitation is always present, more or less consciously in our life; it is always there. But there is something else which is special. As Genesis recounts, after the word “cultivate”, another word immediately follows: “care”. Each explains the other. They go hand in hand. Those who do not cultivate do not care; those who do not care do not cultivate. We are not only invited to share in the work of creation and to cultivate it, to make it grow and to develop it. We are also invited to care for it, to protect it, to be its guardians. Nowadays we are increasingly aware of how important this is. It is no longer a mere recommendation, but rather a requirement, “because of the harm we have inflicted on [the earth] by our irresponsible use and abuse of the goods with which God has endowed it. We have come to see ourselves as her lords and masters, entitled to plunder it at will… This is why the earth herself, burdened and laid waste, is among the most abandoned and maltreated of our poor” (Laudato Si’, 2). There is a relationship between our life and that of mother earth, between the way we live and the gift we have received from God. “The human environment and the natural environment deteriorate together; we cannot adequately combat environmental degradation unless we attend to causes related to human and social degradation” (Laudato Si’, 48). Yet just as both can “deteriorate”, we can also say that they can “support one another and can be changed for the better”. This reciprocal relationship can lead to openness, transformation, and life, or to destruction and death. One thing is certain: we can no longer turn our backs on reality, on our brothers and sisters, on mother earth. It is wrong to turn aside from what is happening all around us, as if certain situations did not exist or have nothing to do with our life. Again and again we sense the urgency of the question which God put to Cain, “Where is your brother?” But I wonder if our answer continues to be: “Am I my brother’s keeper?” (Gen 4:9). Here, in this university setting, it would be worthwhile reflecting on the way we educate about this earth of ours, which cries out to heaven. Our academic institutions are seedbeds, places full of possibility, fertile soil which we must care for, cultivate and protect. Fertile soil thirsting for life. My question to you, as educators, is this: Do you watch over your students, helping them to develop a critical sense, an open mind capable of caring for today’s world? A spirit capable of seeking new answers to the varied challenges that society sets before us? Are you able to encourage them not to disregard the world around them? Does our life, with its uncertainties, mysteries and questions, find a place in the university curriculum or different academic activities? Do we enable and support a constructive debate which fosters dialogue in the pursuit of a more humane world? One avenue of reflection involves all of us, family, schools and teachers. How do we help our young people not to see a university degree as synonymous with higher status, money and social prestige. How can we help make their education a mark of greater responsibility in the face of today’s problems, the needs of the poor, concern for the environment? I also have a question for you, dear students. You are Ecuador’s present and future, the seedbed of your society’s future growth. Do you realize that this time of study is not only a right, but a privilege? How many of your friends, known or unknown, would like to have a place in this house but, for various reasons, do not? To what extent do our studies help us feel solidarity with them? Educational communities play an essential role in the enrichment of civic and cultural life. It is not enough to analyze and describe reality: there is a need to shape environments of creative thinking, discussions which develop alternatives to current problems, especially today. Faced with the globalization of a technocratic paradigm which tends to believe “that every increase in power means an increase of progress itself, an advance in security, usefulness, welfare and vigor; …an assimilation of new values into the stream of culture, as if reality, goodness and truth automatically flow from technological and economic power as such” (Laudato Si’, 105), it is urgent that we keep reflecting on and talking about our current situation. We need to ask ourselves about the kind of culture we want not only for ourselves, but for our children and our grandchildren. We have received this earth as an inheritance, as a gift, in trust. We would do well to ask ourselves: “What kind of world do we want to leave behind? What meaning or direction do we want to give to our lives? Why have we been put here? What is the purpose of our work and all our efforts?” (cf. Laudato Si’, 160). Personal initiatives are always necessary and good. But we are asked to go one step further: to start viewing reality in an organic and not fragmented way, to ask about where we stand in relation to others, inasmuch as “everything is interconnected” (Laudato Si’, 138). As a university, as educational institutions, as teachers and students, life itself challenges us to answer this question: What does this world need us for? Where is your brother? May the Holy Spirit inspire and accompany us, for he has summoned us, invited us, given us the opportunity and the duty to offer the best of ourselves. He is the same Spirit who on the first day of creation moved over the waters, ready to transform them, ready to bestow life. He is the same Spirit who gave the disciples the power of Pentecost. The Spirit does not abandon us. He becomes one with us, so that we can encounter paths of new life. May he, the Spirit, always be our teacher and our companion along the way. 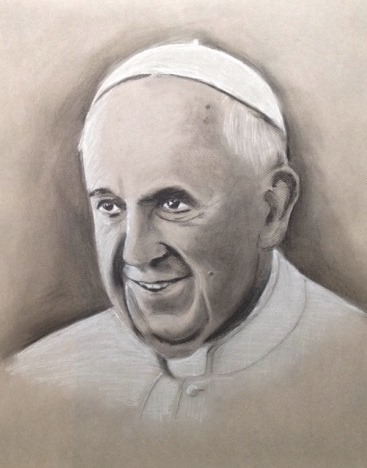 Papal portrait by Brother Patrick Martin, F.S.C.